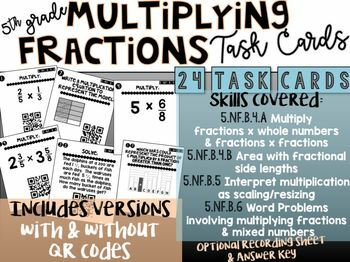 24 Task Cards to practice/review 5th grade Multiplying Fractions & Mixed Numbers skills. Includes 2 versions: with and without QR codes. 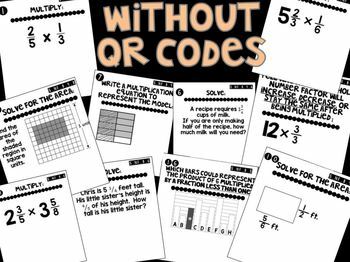 This resource includes a variety of question types and problems designed to cover every part of the CCSS standard (with the standard being assessed labeled on each card for teacher's convenience), making it the perfect tool to ensure that students are prepared for testing. 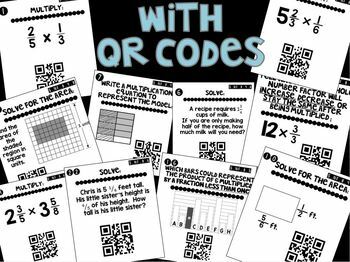 Check out these similar products to get even more 5th grade math standards covered!